At the time that this article is being written, it’s September of 2018. 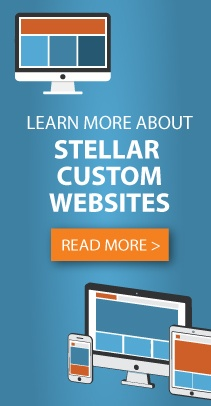 Stellar Blue Technologies has been around for 14 years, and in that time we’ve gone from a team of three working at home from a kitchen table to a team of experts operating a full-service digital marketing studio. Who we are and what we do has changed with the times as well, although at our core we hold true to what we love – creating stellar websites that set our clients apart from the competition. The thing is though, as our team has expanded, so has the breadth and depth of services that we can offer our clients. We’ve been dwelling on this for quite some time now, and we’re pleased to finally turn the page and move into the future with a revised sense of purpose and identity! What does your company do? If you have trouble answering that question in 25 words or less, then you might have a problem. For a while, we found ourselves out of focus as well. We had started to become an organization that was trying to be everything for everyone, without necessarily having a true north. Our tagline for a long time was simply BE STELLAR. While it was fun to say and easy to incorporate into puns and email signatures, it didn’t describe who we are as a company. After a series of brainstorming sessions, however, we pivoted from an imperative ambiguous statement to a concise description of what we do: Strategic Online Solutions. It’s a clever idiom, if we do say so. A client may come to us seeking help – they’re sending an SOS of sorts – help with a new website, an innovative way to reach clients, a desire to stand out among the competition, etc. We took that idea of SOS and made it our own with Strategic Online Solutions. We hear you asking though, “What solutions are those?” We’ve kept it to five simple broad areas: programming, multimedia, design, marketing, and analytics. These categories encompass the majority of requests that come to us from website refresh projects to portal builds, drone shoots, branding opportunities, and much more. You know how the saying goes that doctors are their own worst patients? For a while, we were in the same boat. We were producing outstanding websites for our clients that really met their needs as identified during lengthy kickoff and brainstorming sessions, but we hadn’t done it for ourselves in some time. Our last home page was visually appealing, true, with a series of rotating videos in the hero section accompanied with assorted content, but if you were to land on our home page without knowing a single thing about us, you might not even know that we’re a full-service digital marketing agency. So, what’s changed? Let’s talk creative, first. Our logo has always been a five-point star, playing off of the “Stellar” theme in our name. In keeping with those five points, we’ve streamlined our services into five categories. Then, continuing the “stellar” theme, we updated the background of the hero section to a relaxing dark-blue background galaxy setting with a series of concentric rings forming three orbits. These orbits are filled with icons for our five primary service solutions, and at the center in bold are three words: STRATEGIC ONLINE SOLUTIONS. Now if you land on our home page and know nothing about us, there’s no way you can leave without knowing that this company offers, well, Strategic Online Solutions (and really awesome website design). The home page continues with a story about where we came from, and it shares a series of thoughtful testimonials from past clients. Further down, a rotating banner cycles through an overview of our major services, and a series of question popups with some of our most frequently asked business inquiries to offer guidance throughout the website for new visitors. So, if it’s been a while (like two years or more) since you’ve sat down, given thought to who you are and what you do, and determined whether the content that visitors are consuming when they land on your home page is still relevant or not, then it might be time for a refresh of your own. We’ve been there, too. We can help. Check out what our new website looks like, and then reach out to talk to one of our strategists about providing your next Strategic Online Solutions!